I invite you to enjoy my books exploring the art and science of networking in a networked economy. Networking Is Dead offers a new approach to fundamental networking misconceptions. Authors Melissa G Wilson and Larry Mohl show it’s the quality rather than the quantity of connections that counts. Their fable tells the story of connection expert, Dan, guiding Meredith, an outgoing social media expert, and Lance, a shy accountant, to build relationships that matter to them and their businesses. “101 Great Tips for Building Relationships and Opportunities in the Age of the Network” is designed to help you become successful no matter what the economy is doing, but it is even more powerful in tough times. The Networlding Guidebook is designed as a companion to author Melissa Giovagnoli Wilson’s bestselling book, “Networlding”. The Networlding Participant’s Guidebook walks participants through the process of identifying their core values and identifying the best people with whom to build the most successful networks. Networlding for Teens is an invaluable guidebook that introduces you to the 7 steps of Networlding. It will get you thinking about all of the many people in your life–and perhaps more importantly, the people you would like to know. The Nanosecond Networlders show us that there are compelling new solutions to some of the most vexing cross-cultural, career, and organizational business issues we face today. Drawing from their own experiences as top international business consultants, Whitney and Giovagnoli provide field-tested “cage-rattlers” that can help improve leadership, resolve on-the-job conflicts, stimulate innovation, facilitate better communication, and much more. Social media and social networking are terms that few really understand let alone use in a vibrant, sustainable way to grow their businesses or their careers. 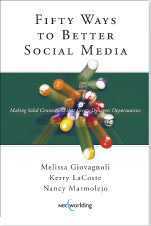 Here is the book that makes learning about and using social media and social networking faster and better. In The Power of Two, two acknowledged business-alliance experts take readers step-by-step through a proven, powerful method for successfully building a network of strategic alliances and for managing such networks via an alliance manager. Angels do exist and they can transform your workplace. With these enchanting stories, noted business author and consultant Melissa Giovagnoli recounts the tales of ordinary people whose random acts of kindness have generated some extraordinary results. “The Wisdom Network” is an eye-opening book that introduces readers to an eight-step process for discovering and realizing the power of the untapped knowledge that exists at every level of their organization. Networlding shows you how to build the mutually beneficial relationships that are the real keys to job satisfaction, career advancement, and personal fulfillment in the 21st century.